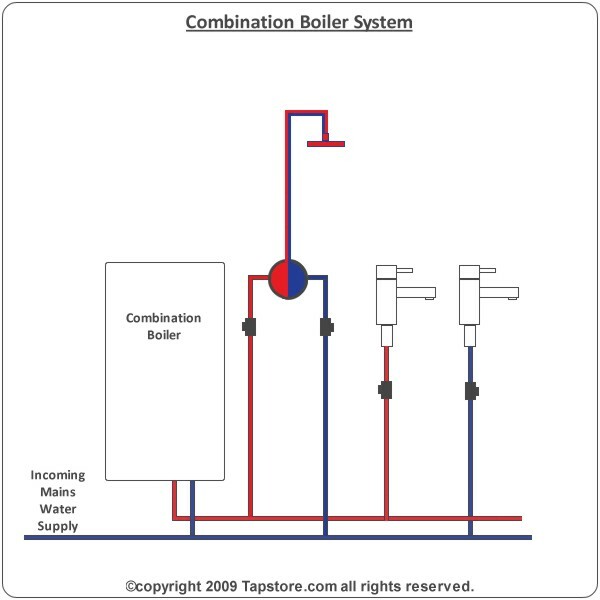 Combination boilers are mains fed water systems which are high pressure and will totally rely on the incoming water pressure and flow to function correctly. You can use most bathroom or kitchen taps and thermoststic showers on a combination boiler system. If you have a combination boiler fitted and are suffering from low mains water pressure or a lack of water flow it is possible to boost the incoming water pressure with a pump but it would normally mean you would have to fit a break tank system if you want to know more then read here. NEW Installations If you are considering having a combination boiler installed do not agree to having a combination boiler fitted if the engineer has not tested your water flow rate and your running and your static pressure. To work out the flow rate of your boiler. If you have your manufacturers guide to your boiler it should state the domestic hot water flow rate that your boiler is designed to acheive it will look something like this DHW Flow Rate @35°C rise = 9.8 l/min which basically means that if we assume your incoming water temperature is 7°C the boiler will be able to heat up the water to 42° C (showering temperature) and it will be flowing at a maximum of 9.8 liters per minute. This flow will improve in the summer months as the incoming water temperature will be higher. To test if your boiler is delivering what flow it should deliver a plumber would use a flow cup and temperature guage, you can replicate this with a bucket and looking at the boiler temperature guage get the water to showering temperature on the hot water tap in the kitchen once it has reached this temperature place a marked bucket under the flow and time one minute then see how much water there is inside the bucket it should match the manufacturers specification. Working out the water pressure. You will need to have some knowledge to work out which pressure you have on your system although it is fairly safe to say that you should have a minimum pressure of around 0.7 bar as most combination boilers will not work with less than this pressure, to have an accurate pressure reading you will need a pressure guage, these are readily available from plumbers merchants. There are two types of pressure that we need to look at with a mains system firstly the static pressure this is the measurment of pressure with no appliances running on the system, the second is the running pressure this is the pressure you will have with once you turn on an appliance, an example is static pressure of 3 bar tested with no items on, turn on the kitchen tap and the pressure goes down to 1.5 bar (running pressure). With combination boilers you always use a thermostatic or pressure balancing shower valve.